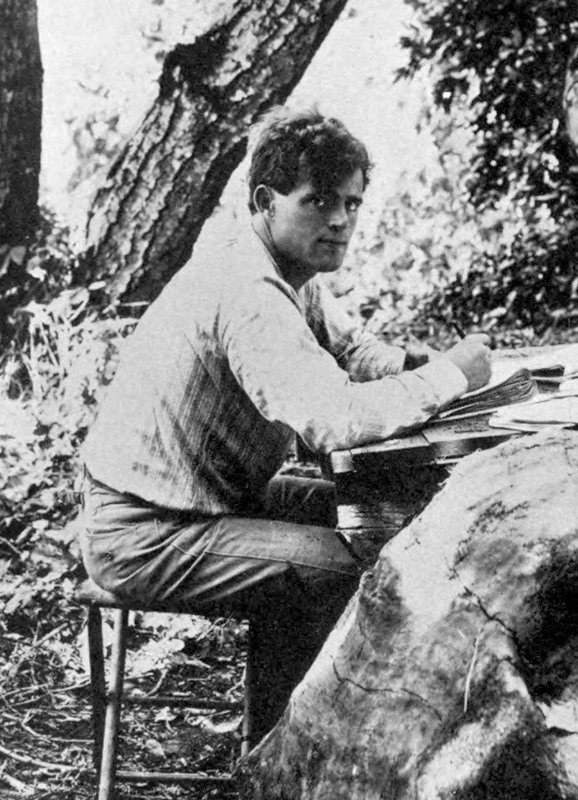 Early honorary members included Jack London, George Sterling, John Muir, Joaquin Miller, and the first California poet laureate, Ina Coolbrith. The first WEST WINDS, a hardcover collection of fiction by members, was published in 1914 and was illustrated by California artists. Since that time three other WEST WINDS have been published. “Writers Memorial Grove” at Joaquin Miller Park in Oakland celebrates California’s great writers with the planting of trees. The first tree was planted for Joaquin Miller. Bret Harte, Charles Warren Stoddard, Edward Roland Sill, Ina Coolbrith, Jack London, Mark Twain, Charles Fletcher Lummis, and Edwin Markham are so honored as well as Dashiel Hammett, Gertrude Stein, and historians Will and Ariel Durant. The first California Writers Club Conference was held in Oakland in 1941. Today, one-to-three day conferences are held by various Club branches around California. Each attracts from 100 to 400 writers and each conference hosts editors, authors and publishers from all over the United States presenting lectures, workshops, and panel discussions on all aspects of writing. In 2003, the California State Assembly officially declared the third week in October each year as California Writers Week. 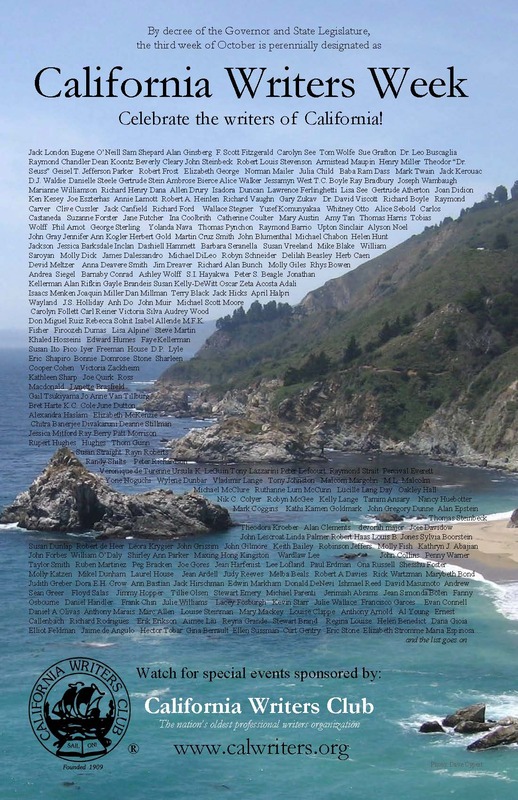 The following authors were selected for the California Writers Club Joint Legislative Resolution in 2003. For several months in early 2003, with the expert help of Anthony Folcarelli, the Central Board of the California Writers Club worked to establish California Writers Week. The plan was successful and on September 4, 2003 at 10 a.m., California Writers Club members gathered on the Assembly floor in Sacramento to receive a Joint Legislative Resolution from Assemblyman Tim Leslie. The Resolution is endorsed by the California Library Association. Former CWC President Barbara Truax (holding resolution) with Assemblyman Tim Leslie and Anne Marie Gold, member of the executive board of the California Library Association and head of the Sacramento Library. Central Board Representatives join Barbara on the Capitol Plaza for a photo op. The whole gang joins Barb outside the capitol. Left to right: Dianne Levy, Marin branch president and CWC webmaster; Dave Sawle, Berkeley branch representative; Carol McConkie, Redwood branch president; Jeremiah O’Brien, Marin branch representative; Bill Baldwin, South Bay branch president and Central Board representative, CB Secretary; Amy Peele, Marin branch; Anthony Folcarelli, Sacramento branch and Special Consultant to the Central Board; Tom Adams, Sacramento branch representative and CB Vice President, Jackie Krug, Sacramento branch; Marilyn Smith Murphy, Sacramento branch. Front: Teresa LeYung Ryan, Peninsula branch; Beth Tigner, Sacramento branch; Shirley Adams, Sacramento branch; Barbara; Octavia Simien, Sacramento branch president. Photographs by Dianne Levy and Don Truax. RESOLVED BY ASSEMBLY MEMBERS TIM LESLIE, JOSEPH CANCIAMILLA, GUY S. HOUSTON, BILL MAZE, GENE MULLIN, JOE NATION, AND PATRICIA WIGGINS AND PRESIDENT PRO TEMPORE OF THE SENATE JOHN L. BURTON AND SENATORS NELL SOTO AND JACKIE SPEIER, That they recognize the third week in October as California Writers Week, and encourage the people of the State of California to reflect upon the contributions that California writers have made to humankind. Members Resolution No. 2170. Dated this 4th day of September, 2003. 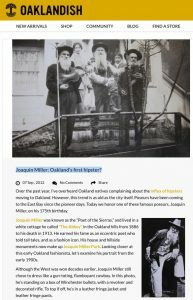 Here’s an excerpt from Oaklandish suggesting that Joaquin Miller was Oakland’s first hipster. Joaquin Miller: Oakland’s First Hipster? Over the past year, I’ve overheard Oakland natives complaining about the influx of hipsters moving to Oakland. However, this trend is as old as the city itself. Poseurs have been coming to the East Bay since the pioneer days. Today we honor one of these famous poseurs, Joaquin Miller, on his 175th birthday. Although the West was won decades earlier, Joaquin Miller still chose to dress like a gun-toting, flamboyant cowboy. In this photo, he’s standing on a box of Winchester bullets, with a revolver and decorated rifle. To top if off, he’s in a leather fringe jacket and leather fringe pants.Joaquin Miller was known as the “Poet of the Sierras,” and lived in a white cottage he called “The Abbey” in the Oakland hills from 1886 to his death in 1913. He earned his fame as an eccentric poet who told tall tales, and as a fashion icon. His house and hillside monuments now make up Joaquin Miller Park. Looking closer at this early Oakland fashionista, let’s examine his portrait from the early 1900s. 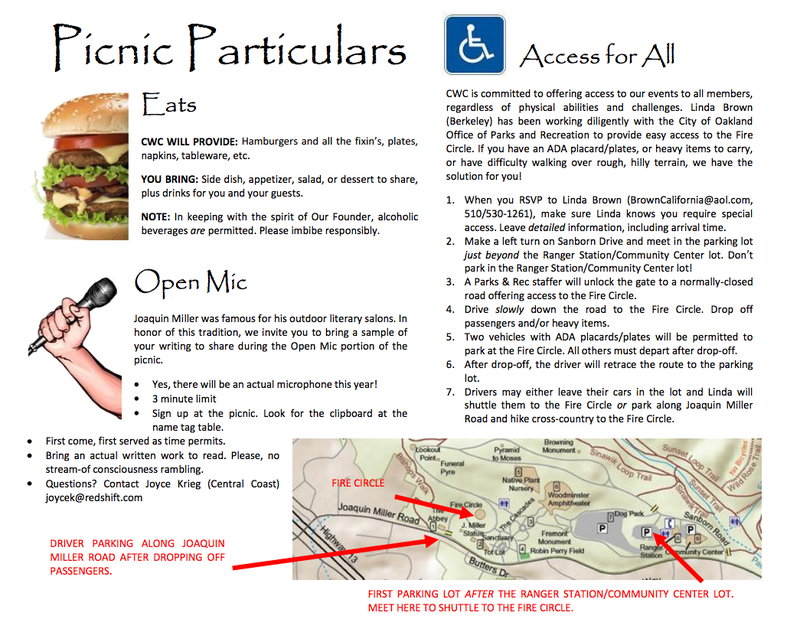 In 2010 the California Writers Club brought back its tradition of hosting a picnic at Joaquin Miller Park in Oakland. The California Writers Club archives its historic original papers at the Bancroft Library, UC Berkeley, Berkeley, CA, one of the largest and most heavily used libraries of manuscripts, rare books, and unique items in the United States. The collection contains club correspondence, meeting minutes, photographs, scrapbooks, and clippings, and is stored part onsite, part offsite. Advance notice is required for use. The CWC marked its centennial by presenting a time capsule recording the changes unfolding in the world of publishing. It is scheduled to be opened in 2035 in commemoration of Mark Twain’s bicentennial. Also included in the collection is material documenting the origins of Woodminster Amphitheatre and Writers Memorial Grove, an early CWC project in Joaquin Miller Park, Oakland, CA. The Bancroft additionally maintains papers of early California writers associated with the CWC, among them Gertrude Atherton, Ina Coolbrith, and Jack London. For information about accessing these resources, visit http://bancroft.berkeley.edu, email bancref@library.berkeley.edu, or phone 510-642-6481.
a spray Of salt wave washed his swarthy cheek. Ah, that night Of all dark nights!